Beautiful picture of Neuschwanstein Castle in the background. 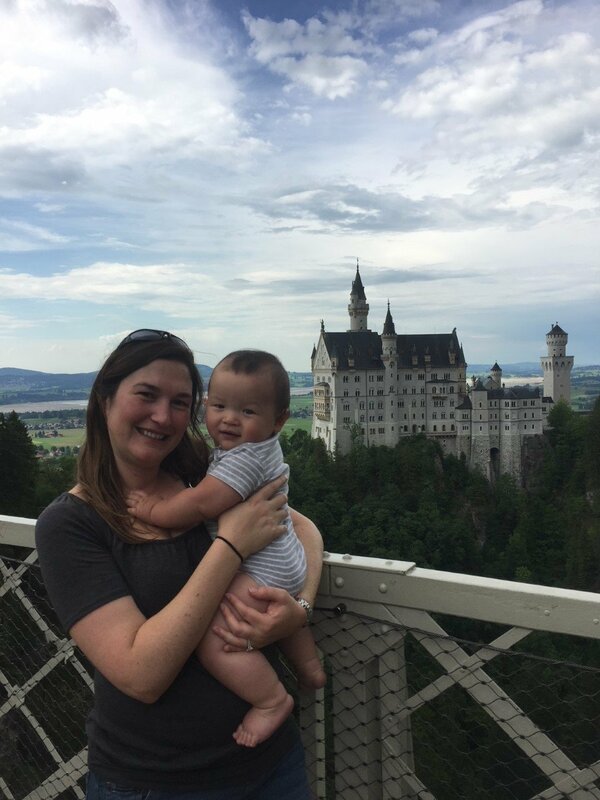 Mommy And Me Travels is on one of our favorite family trips, visiting The Neuschwanstein Castle. While traveling to Garmish, we stayed at the Edelweiss Lodge on the military installation. We used Edelweiss as a jumping off point for many adventures such as the two I will talk about today. We mapped out where we wanted to go and just over 30 minutes away were these treasures. One of King Ludwig II castles’ is The Neuschwanstein Castle (Schloss Neuschwanstein). The castle was open to the public weeks after King Ludwig II death. It now attracts more visitors than any other castle in Germany. There is no guess why this place is so popular, upon reaching the castle it is like stepping into your favorite fairy tail. It is said to have been the inspiration for the Disney Theme castle. Picturesque view of a modern castle. The Neuschwanstein Castle is nestled up high in the hills in southern Bavaria. To reach the castle you have three options; bus, horse carriage, or with your own 2 feet. Since I was traveling with two little boys, I chose for us to go up the hill by horse carriage. It was a small fee but worth not having to listen to “fussing” from my son on how tired he would have been walking up it. Not to mention my baby was being carried. After the quick horse ride up, ~11 mins, you immediately are in awe at the spectacular building. Old map of the surrounding area. Tickets for entrance to the castle can only be purchased from the ticket counter at the bottom of the hill. Don’t forget to pick up your tickets before you head to the castle. There are scheduled tour times and it is the only way to view the inside. There is no photography allowed inside. Restoration of different rooms are normally taking place, so don’t be disappointed if this happens on your tour. If it isn’t one room it’s another. The tours are quick, about 30 mins. This was the perfect amount of time to keep my kids attention. Near the entrance where the tours begin. Inside the castle walls. View of the backside of the Castle. You are able to see Queen Mary’s Bridge (Marienbruke) from the castle. It is a short hike out but the best place to get pictures. If you schedule a morning tour, try to get there early enough to beat the crowds, usually before your tour starts. If you do venture out later in the day or right after your tour expect to wait your turn to get on the bridge. Great historical nugget about the bridge. A good day! Smiles all around! Beautiful view of the castle from the bridge. Once you make it back down the hill, same options as above, don’t miss the other places that you can visit and explore while possibly snapping a picture or two of the castle plus a bonus of the Hohenschwangau. We chose to visit the Tegelberg Cable Car. Lots of hiking trails for pictuesque scenery. Tegelbergbahn happened to be the highlight of the trip for my sons. First we took the cable car up to the top. You can take pictures of both castles on the ride up and down but not once you are at the top. There is a great bier garden to grab a bite to eat and relax while enjoying the great outdoors. We hiked around a little to stretch our legs and let the kids burn a little energy. After our hike we took the cable car to the bottom. At the bottom the place has a huge park for children to play as well as a toboggan run. (Yes you read that right, a toboggan run!) Needless to say we spent hours playing at the park and riding the toboggan. Between the cable car ride, hiking, playing, and tobogganing, my son’s vote was that Tegelbergbahn was the better of the locations that day, hahaha. View from the tram windows on the way up the mountain. Spectacular views of the area. Including Neuschwanstein Castle. Great food at 1700 meter elevation. Looking back while heading to the top of the hill on the Tobogan. Neuschwanstein is definitely a castle worth visiting. Have you been? What are your thoughts about it?